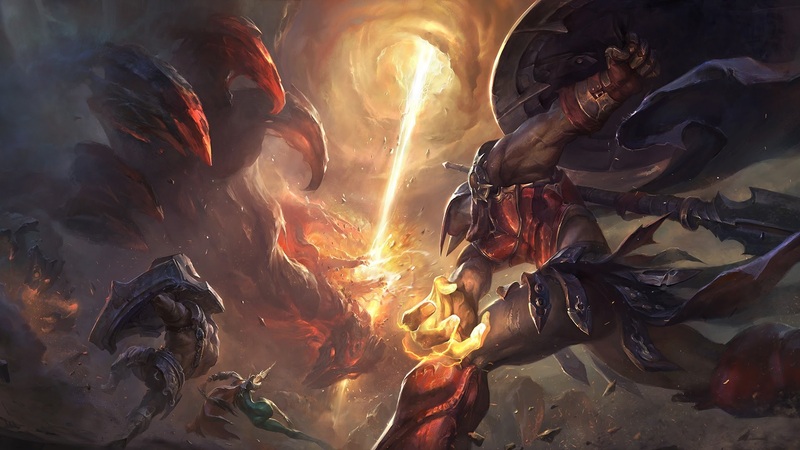 We have our champions for Season 5 but is it all that surprising? 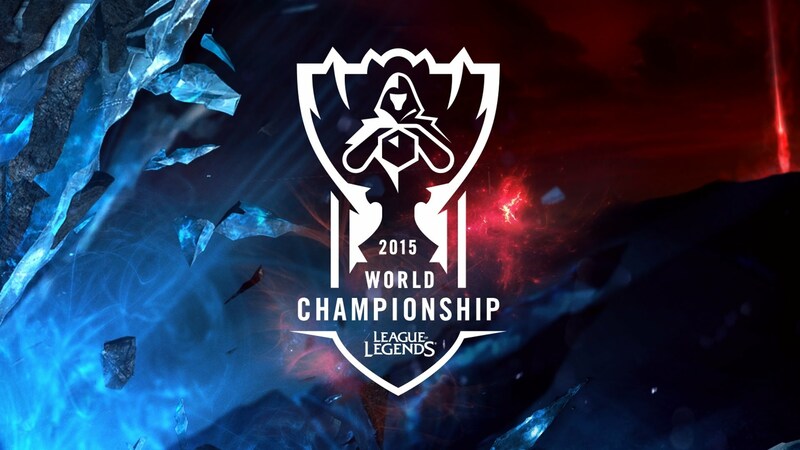 SKT have secured, for the first time in LoL competitive history, a 2nd World championship. It was pretty much the same game SKT played since the start of Worlds, get even or ahead in gold slightly then slowly gain a large lead with better teamfighting and rotations. There was one instance where SKT messed this formula up and that was in game 3. For some odd reason, SKT members filtered in one after the other into a fight they’ve already lost giving KOO Tigers a great lead early that let them snowball into a win giving sKT their only lost at Worlds. What Does This Mean For Other Regions? Well other regions need to step it up, especially NA. Now when I mean regions I mean the stronger regions like Korea, China, Europe and North America. Last year, Europe were the ones who really dropped the ball but came back so well this season. This year, Europe had a really good chance with Fnatic and, surprisingly, Origen being contenders. North America did not come into Worlds to win at all; CLG collapsed in the 2nd week of group stage, Cloud 9 did surprisingly well for a horribly struggling team but in the end couldn’t make it work out, and a majority of people thought TSM wouldn’t get out of groups and they didn’t. Overall it seems like Chinese and the Korean scene always has a team or two that’s a shoe in for the finals. North America hasn’t contested that position in a long time & and Europe was able to this year. The focus for teams in both these regions should be to be a real threat to other regions come these international events. This means being consistent & winning a majority of your games in the Spring/Summer splits. It means fixing important mistakes and not letting them come back 4 weeks later in a split. It’s about keeping cool under pressure and not tilting in series. It’s about communication being clear so that the team can play as one. I know it’s not easy but these things are what SKT brought to Worlds and they were able to win it all. If NA or EU teams want that Summoner’s Cup, something has got to give. So I got around to watching the semifinal games for Worlds and as expected SKT made it to the finals. KT Rolster made it to the finals as well but not in a way I expected. Let’s start with Origen vs SKT. I think everyone knew this was going to be an uphill battle for Origen. In an interesting twist Easyhoon, and not Faker, played the semi finals. This was probably a strategic move in order to not give away Faker’s pocket picks for the finals. Origen’s first mistake in the first game was not banning Kalista and leaving Fiora open. At least that’s what I thought in picks and bans but Origen was able to keep ahead until around 30 minutes. Then the Fiora and Kalista picks started to shine. With the quick flanks and high burst damage Fiora has late game, the easy baron secures from Kalista, it helped SKT bring the game back. The big mistake for Origen that broke the game open for SKT was getting split up between Baron and a split pushing Fiora taking bottom inhibitor which resulted in a loss of both. I will say thought that Origen played super well around Niels who was on Tristana wrecking face. Game 2 resulted in a similar game pace where both teams were close in gold but SKT mangaged to pull ahead objective wise which helped them snowball into a lead with Baron. Origen didn’t play as well in this game. Game 3 resulted in a 25 minute win. I think Origen’s morale was a little low going into Game 3. Another thing to note is that I feel Amazing’s positioning at times were really poor during all three games. Also, some early focus needed to go top lane in game 1 which they corrected in game 2 but I feel the amount of focus in game 3 on Marin was a bit too much as took away from the other areas on the map pressure wise. Over to KOO Tigers vs Fnatic. The first game wasn’t bad actually expect that Fnatic gave up way too many Dragons for their gold lead that didn’t result in much as the game went on. KOO started to pressure more and more as the game went on. The 5th Dragon forced Fnatic into a situation where they had to take Dragon otherwise KOO Tigers would win with 5th Dragon + late game Kassadin. It turns out that Febiven on Leblanc got really chunked out mere seconds before the fight started and that pretty much sealed the fight and the game. The second game Fnatic picked Skarner. Now, I’m all for pocket picks but Skarner needs a team behind him doing damage while you slow the enemy team down. I didn’t see any of that happen. And Kuro picked Veigar which pretty much counters Skarner’s chance of ulting someone productively. Since Kuro, yet again, picked another late game champion (who can one shot not less), Smeb and Pray having a better time than their lane counterparts and the score being 17-4 in KOO’s favor at 30 minutes, you could tell the game was pretty over. The last 3rd game was such a stomp. The chain CC and the winning lanes on KOO’s side pretty much sealed the game at 20 minutes. So what went wrong for Fnatic to lose 0-3? First off is surprisingly the Kennen ADC pick. I know it’s a cool pocket pick that has been working for them at Worlds but I felt it would only go so far. It turned out semis was that limit. Fnatic realized this and went for more traditional AD carries but in game 2 went for Skarner which, in my opinion, is not a good pick when it can be counter picked; for example, Veigar. Game 3 I felt Huni just tilted hard which never helps Fnatic and the morale was low enough for KOO to take the final win. Now the question is: who’s going to win Worlds this time? I think it’ll be SKT but it could be a 3-1 series given KT Rolster played rather well versus Fnatic who many would argue is a stronger team than Origen. It’d be highly interesting if the games were close and went the 5 game distance. Another question to be answered is if Faker or Easyhoon will be playing in the finals. I’d imagine it’d be Faker but you never know. It’d be cool to see SKT take it because they would be the first team to win 2 LoLWorld Championships. We’ll see what happens when these two Korean teams throw down on Halloween! So the Quarterfinals panned out pretty much as expected. Some games harder to call than others. 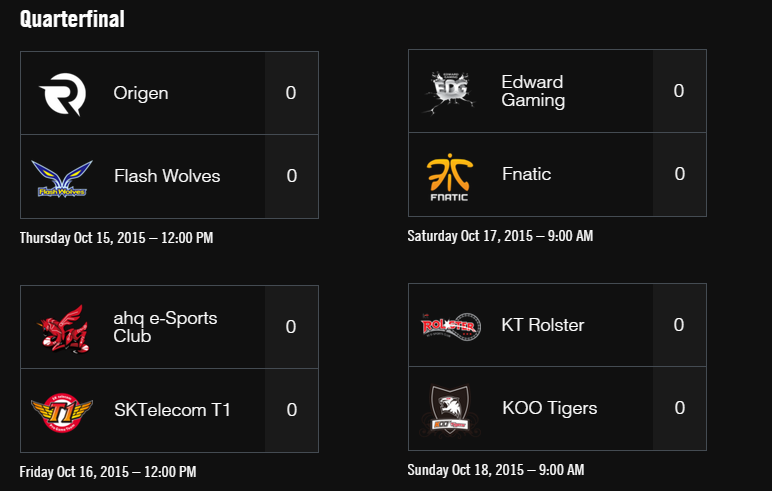 In the end we have our final four: Origen, SKT, Fnatic and KOO Tigers. Flash Wolves vs Origen was purely about who would show up. And it was Origen. I have to credit the Anivia pick Origen’s xPeke used that Flash Wolves did not punish at all. In fact, I’d go as far to say that Flash Wolves deserved to lose because they didn’t ban the Anivia pick; they clearly didn’t know how to play against it. SKT vs AHQ. Not much to say about this one. I hate to say it but this wasn’t a priority series to watch for me because I knew SKT would win. Maybe AHQ could take one game. But nope, the 3-0 came in. The Ryze on SKT’s Faker was a nice surprise though. Fnatic vs EDG was one I was excited to watch because I felt it would be a close series. In game one it felt close but Fnatic was able to pull it back. They used that momentum to with the other two matches for another 3-0 sweep in the quaterfinals. It looks like Fnatic’s Rekkles’ ADC Kennen is quite the threat. Also Fnatic showed diverse styles of play which they also win at; this will make semi-finals fun to watch. Finally KT Rolster vs KOO Tigers. This was hard to call simply because both teams are on the same level. Then KOO’s Smeb got to play Fiora in game one and did really well. And then he got it in games 2 and 3. Yup, that’s right another clean 3-0 sweep. Granted KOO’s Gorilla and Kuro did work as well. First, and this is big, teams need to ban out champions they have a problem with. For crying out loud two of these series showed stubbornness in this and the stubborn team lost their series because of it. For Origen vs SKT, I think Origen’s run is over as SKT is just a solid team and I think Faker can keep xPeke’s Anivia down enough if the pick goes through. For Fnatic vs KOO Tigers it’s hard to say but I think Fnatic will win. Fnatic is a team, in my opinion, that shows the most diverse styles of play and I think their players can take on KOO’s players rather decently in the laning phase. Man, these last two weeks have been interesting to watch. To be quite honest with you all, I had predetermined a lot of results for this Worlds. In this respect I thought it would be a boring Worlds to watch. I was wrong. I was so dead wrong. This has been the most interesting Group Stage of Worlds I’ve ever seen. Let’s jump right into it. If I told you that Cloud 9 and Origen would be the the top of their respective groups by the end of week 1, you would have called me insane. And you would have been well within your rights to do so. But it turns out that’s exactly what happened. Cloud 9 toppled AHQ, Invictus and Fnatic. These 3 teams are not push overs. With Cloud 9’s run in the summer split, Hai coming in 2-3 months before Worlds as the jungler, and everyone except Sneaky always performing well, you can see why people had low expectations. But they managed to put up some convincing games. A similar story for Origen. Not in terms of having weak players but just not strong enough to beat the likes of KT Rolster and LGD Gaming. However, they too went on a hot streak of wins. The team I believe was the most disappointing was LGD Gaming. They were a 1st seed and very hyped to get out of groups but they did not show up at all in the first week. TSM was lacking in performance as well but it wasn’t expected that TSM would do well this year. Week 2 was a turnaround week for most teams. 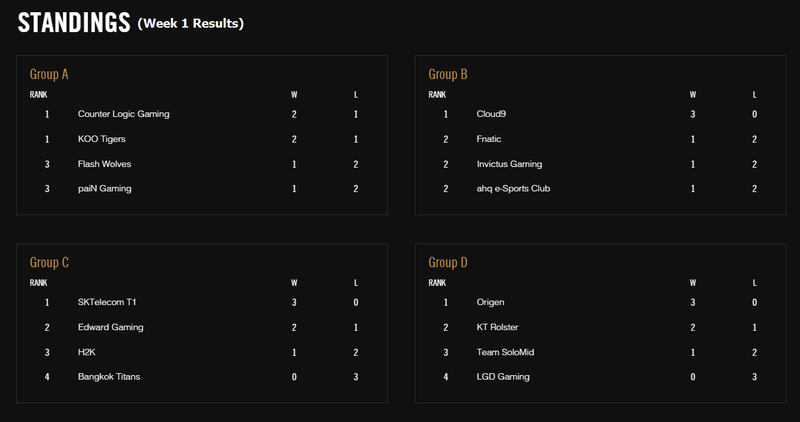 Group C pretty much doubled their win/loss from Week 1. There wasn’t much expectation for Bangkok Titans and H2K to go through since the Titans part of a weaker region and H2K did not have a stellar end of the split in LCS. Also, the fact that they were against EDG and SKT which are teams that have proved to be exceptionally good teams wasn’t in their favor. Group A was very surprising as Flash Wolves made a surprising comeback and 3-0 for week 2. Another upset was CLG. They sadly went back to their ways of good steak/bad streak which I honestly thought was fixed. They did run similar comps throughout their matches. Pain Gaming was surprisingly good in the 2nd week and actually put pressure on teams. They can be a decent threat next year. Group B was interesting as AHQ and Fnatic showed up and both made 3-0 comebacks looking way better than in week 1. For Group D LGD Gaming looked better than in Week 1 but it wasn’t enough to comeback. TSM was disappointing in their performance, they had one decent game but their problems showed. The drawing for the quarterfinals was done live right after the last match for groups. Origen vs Flash Wolves I really can’t say who would win this. On their best days I think both teams will be pretty even. If I had to choose, I’d go Flash Wolves. AHQ vs SKT I think SKT has it. AHQ did do way bettern in the 2nd week but SKT is another beast of a team to play against. EDG vs Fnatic will be an explosive one; possibly to all 5 games but I think Fnatic can pull a win out of that matchup. KT Rolster vs KOO Tigers is another matchup that can be really close if both teams bring their A game. If I’d have to pick, it’s be KT Rolster on this one. And that does it for covering groups. We’ll see how Quarterfinals pan out. To find out more, check out Riot’s official post. Good luck on the Fields of Justice!